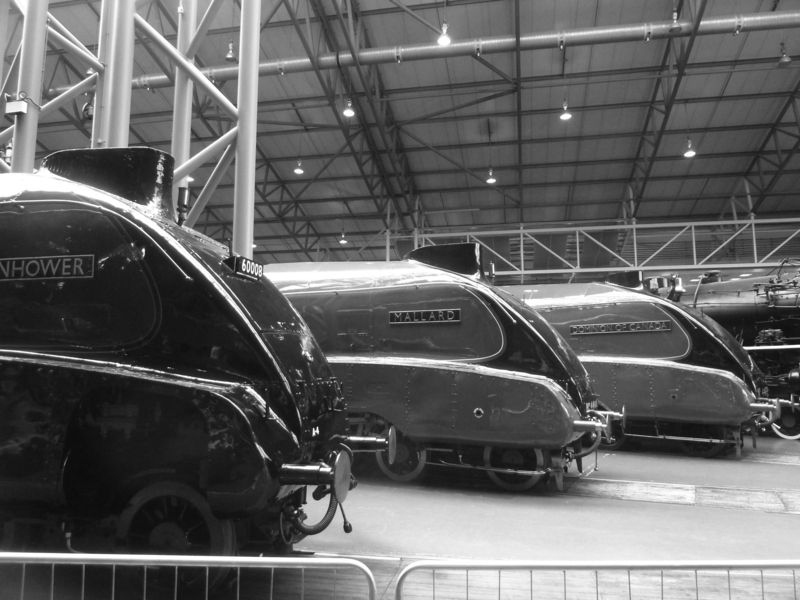 The most elegantly streamlined of all British Rail’s steam locomotives was the Great North Eastern Region A4 class of which an engine called Mallard is the best known of the 35 built at Doncaster works. Designed in 1935 by Sir Nigel Gresley, whose earlier A3 class (of which Flying Scotsman is the preserved example) was in terms of classy looks arguably the apogee of the conventional un-streamlined locomotive, the A4s, or Streaks as trainspotters dubbed them, pulled blue riband expresses between King’s Cross and Edinburgh/Aberdeen. Few who have seen one will forget it because they represent the most dashing solution to their function. In terms of efficiency (especially if fuelled by the best Welsh coal) it was as reliable and as quick as Charles Collett’s ‘King’ class of the Great Western Railway, though far racier on the eye. Often over the 13 years of The Jackdaw an argument has been advanced that as a work of sculpture, of form, of beautiful workmanship, an A4 (or, indeed, a Collett ten-wheeler or a Stanier pacific) is immeasurably more stimulating than any lifeless metal behemoths by Anthony Caro or Richard Serra. Presented with a do-or-die choice between an A4 and a row of yellow tin lock-ups by Donald Judd the answer is a no-brainer. To celebrate the 75th anniversary of Mallard screaming down Stoke Bank between Grantham and Peterborough at over 126 mph on July 3rd, 1938, and thereby establishing a world speed record for a steam locomotive, the National Rail Museum has taken three years to arrange the delight of bringing together the six preserved Streaks, three of which are still in steam and one of which only a few weeks ago was breezing up the east coast main line pulling a long rake of coaches at close to a ton. Two of the six have been generously loaned from museums in Canada and the USA. It cost the NRM a great deal in money and ingenuity to achieve this feat of organization. One suspects the resulting exhibition has almost bankrupted them. But it was worth it. The record crowds smiling at the gleaming spectacle of their line-up parade is testimony to that. The Great Gathering, as it was dubbed, took place in July and was free to the public. Recently threatened with closure by its parent, the Science Museum, I fear the NRM missed a trick here. Nobody would have complained at paying a fiver or more for the privilege of seeing these engines together for what certainly will be the last time. And anyone attending would have realised immediately the crucifying expense involved in making this possible. The National Gallery is currently charging £15 to see in its basement an exhibition of pictures normally shown free of charge two floors up. In other walks of life we call this cheating but we live content with this sort of distasteful scam in the visual arts, while the NRM are obviously not up for such scheming dishonesty. As we have mentioned here before the NRM is among few museums which don’t seem to lie about their attendance figures. We have noticed over the years, for example, that the place is always well attended though it registers far fewer annual visitors than museums which give the impression of being empty almost all the time. It’s a fact that most museums lie about their attendance. So, there they all stood arranged on the spokes off the turntable in the engine hall, newly painted and buffed to a high shine by volunteers. The crowds of enthusiasts were delighted. Never would you see in any other museum such visitor attention to detail, such appreciation of refinement, as you get in the NRM. It’s one of those places where visitors could probably lecture the staff. The public love this place and they show it. Doubtless the sponsor, train set maker Hornby, was delighted that the six engines looked as spit-and-polished as a guardsman’s boots on parade, just like enlarged versions of their models. This perfection, however, presents a problem in the days of preserved locomotives because it renders the object tartily unreal, for in memory they were never like this. Engines were neglected and abused, especially after 1945 when most looked like vagrants. They were expected to work hard and get used to being caked filthy, which more often than not they were. One would have loved to have seen these six engines outside the engine house, dirty and simmering in air aromatic with the cocktail of steam, coal fire and sump oil. Here, they looked marvelous but it all seemed remotely decorative and lifeless. One would also have preferred to see them without their matching headboards bearing the sponsor’s name and the silly overblown legend, The Great Gathering. These inauthentic plates ruined the lines of the smoke box. It was as if BP had slapped their logo on the winning face in their annual portrait competition. When the Dwight D Eisenhower arrived from Green Bay in Wisconsin a few months before the event it was still in its working black livery, with rivets bursting and pressure-twisted, and with panels pitted as though recently returned from a war zone. It looked more the part then than it does now in its dashing green coat and frilly knickers. The sense of elegy lurked heavily behind the thick gloss paint and gaudy souvenirs. Here was an example of genius in engineering and design, manufactured and cast from the steel of Scunthorpe and Teesside, and built by the boilermakers, rivetters and tradesmen of Yorkshire and Lancashire. How many schoolchildren have heard of Gresley, Stanier, Bulleid, Ivatt, Thompson, Collett or Churchward? Or Armstrong, North British, Vulcan, English Electric, Beyer Peacock, Metropolitan Vickers? Or emotive towns like Horwich, Newton-le-Willows, Crewe, Derby, Stratford, Swindon, Barry, Brighton and Eastleigh? The NRM will never be allowed to shut for lack of money because it is too genuinely popular. Enjoyment and surprise are visible on every face. Retired engineering blokes explain the workings of valve gear to one another and visitors young and old discuss and compare exhibits enumerating their favourites. You never see this happen in the National Gallery where the body language of corpulent tourists tells of universal drudgery and attendance under sufferance. The NRM deserve more than our thanks for arranging this smashing event – they deserve our cash. They desperately need donations. If you’re reading this and not short, and were perhaps in distant days a trainspotter, please send them a tenner.